Venerable Prof Samdhong Rinpoche is an eminent and distinguished scholar, teacher, philosopher, and a life-long campaigner for Gandhian principles, especially that of non-violence or peaceful resistance. Born as Samdhong Lobsang Tenzin in 1939 in Tibet, he was recognised and enthroned as the reincarnation of the fourth Samdhong Rinpoche when he was five years old. He began his monastic studies at age twelve and eventually obtained a Doctorate in Buddhist sciences at Gyutö Monastery, Dalhousie, India. In 1959, Prof Rinpoche fled to India to escape the repressive Chinese government in Tibet. He was commissioned by His Holiness the Dalai Lama to serve as a teacher to monks in exile. In 1988 he was appointed director of the Central Institute of Higher Tibetan Studies in Varanasi. 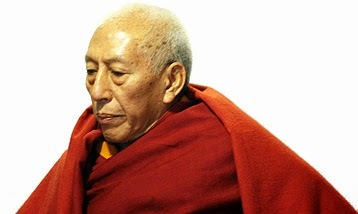 Prof Samdhong Rinpoche is the first elected Kalön Tripa or Prime Minister of the Tibetan government in exile, a position he held from 2001 to 2011. He is the first political leader to be directly elected by the people in exile. He is regarded as one of the leading Tibetan scholars of Buddhism and is also an authority on the teachings of Gandhi. Prof Samdhong Rinpoche is fluent in Sanskrit, Hindi, English and of course Tibetan, his mother tongue. He has published over sixty studies and interviews in different university publications and in the press.